Simply Stylish love bringing together unique design, good vibes, ethically sourced quality clothing. We work with companies known for their passion in the world of yoga and fitness to find fun, stylish lovable peices for your wardrobe. Our clothing journey started by finding inspiring apparel collections - clothing that tells stories, beliefs & inspires with personal messages. Sourcing from a heartfelt place of compassion, equality & always rocking good vibes! The best way to be, every inch is lovable, A masterpiece! Loose unisex T shirt.  SHoulder taping and longer body length. Wear with sleeves rolled up for a cool vibe! The best way to be, every inch is perfection, A masterpiece! In a blend of hemp and rayon, Thought's new-season dip dye top is soft, durable, and easy to care for. With a unique drawstring front and comfortable dropped shoulders, this oversized hemp top is perfect for wearing on the weekend with leggings or your favourite jeans. Sustainable fashion at it's very best. A much-loved bamboo and organic cotton jersey, this relaxed-fitting tee features a unique placement print designed by the aware winning ethical fashion house Thought. Wear this casual top over our bamboo leggings or your favourite jeans for the weekend. In a luxe organic cotton fabric, our double layer top is a clean and classic addition to your loungewear wardrobe. Featuring a dropped hem and long sleeves, a relaxed fitting top. Pair it with your favourite leggings for a chic workout look. In a luxe organic cotton fabric, our tie knot top comes in a boxy shape with a scoop neck and batwing sleeves. Throw on this relaxed top over your favourite leggings or jeans for a casual weekend look. In a stretchy fit, our skirted leggings are a very popular style season after season. These super soft bamboo leggings feature a comfortable waist and are perfect for yoga or lounging on the weekend. Our super soft bamboo leggings are fitted in the leg with a comfortable stretch waistband. Slip these printed leggings on at the weekend or rock them at your yoga class. Introducing Thought's new women's sweatpants. In a thick bamboo and organic cotton fleece back fabric, they are super soft, comfortable and breathable. Featuring a drawstring waist, practical side and back pockets and rolled hems, these loose bamboo sweatpants are perfect for wearing on the weekend or for relaxing in the evenings. Introducing our new women's roll neck top. It features a contemporary, woven Tencel panel at the front with a bamboo jersey back and sleeves, making it breathable and soft. 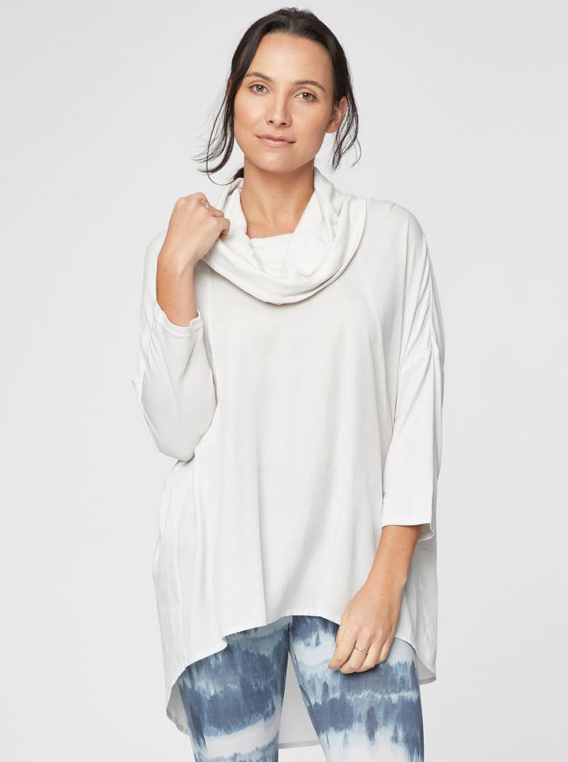 With a double layer cowl neck, and 3/4 length sleeves, this oversized top can be paired with your favourite jeans or leggings for a casual style. White 100&% cotton tee with loose long line fit. Adorable seqin angel wings design on the back. Pefect over leggings or jeans. Light Grey 100&% cotton tee with loose long line fit. Adorable seqin angel wings design on the back. Pefect over leggings or jeans. 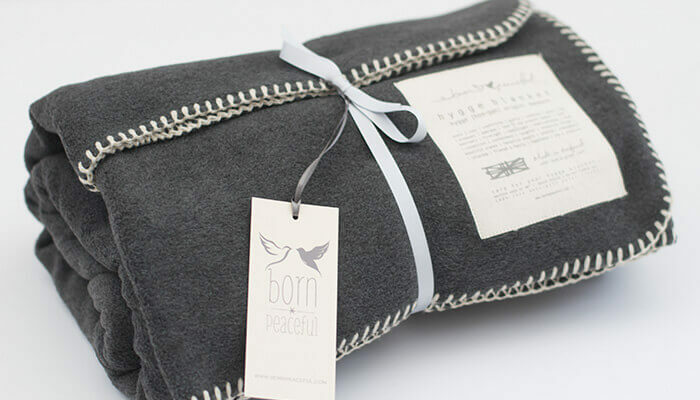 This blanket also makes a lovely gift or present and is equally versatile for use in the home. So why not pour yourself a glass of something special, wrap yourself in this blanket, cuddle up on the sofa and experience 'Hygge' for yourself. 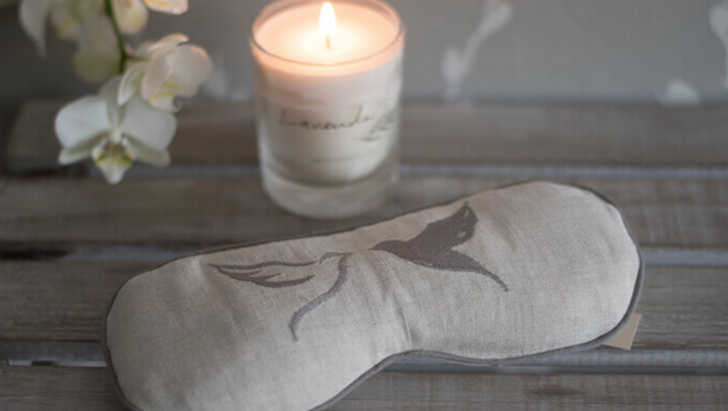 Soothe and relax your eyes with this Natural Linen Eye Pillow with Lavender and Flaxseed filling. The linen fabric is soft and cooling. The pillow gently moulds to the contours of your face with a light pressure, blocking out light, relieving tension and calming the muscles around the eyes. The subtle lavender scent is uplifting for the mood and relaxing and calming to the senses. Perfect for deepening relaxation during Yoga. Comes wrapped in tissue paper within a recycled board box. Makes a perfect gift.